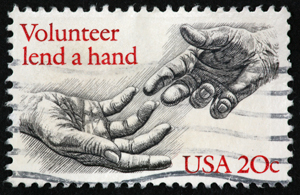 Volunteers are a crucial part of the Catholic Social Services organization. By volunteering your time and your energy, you give to your community in a very personal and valuable way. Come join us in helping your friends and neighbors in need. We have a special program called RSVP (Retired and Senior Volunteer Program) that is part of the national "Senior Corps" initiative designed to utilize the skills, talents and energy of our older citizens in the community. Call them directly for available opportunities at 729-9166. Whether you can offer a few hours in one of our two food pantries, help setting up a CYO sporting event or a little time to help seniors get to their medical appointments, Catholic Charities can use your help. You can help set up a CYO sporting event, work with the kids, coach them, mentor them, share your knowledge, wisdom and skills with a new generation through athletics. It's a great learning experience for the youngsters, an incredibly re warding experience for you. Contact CYO at 584-7800. To become an RSVP or CYO volunteer, contact them directly. For the remaining Catholic Charities volunteer oppotunities, fill out and bring in the Volunteer Application to 232 Main Street.